The solitary Brownshill Dolmen is one of Ireland's most impressive prehistoric monuments, maybe the best known in the southern part of the province of Leinster, and should not be missed. It is also the dolmen of many names - sometimes written "Browneshill Dolmen", or even "Browne's Hill Dolmen", in Irish called Dolmain Chnoc an Bhrúnaigh, and officially also known as the Kernanstown Cromlech. Take your pick. In any case, a ​dolmen is a dolmen is a dolmen – and in this case, you’ll see the remnants of a megalithic portal tomb, situated about three kilometers east of Carlow Town in County Carlow. Rush and you miss it - the Brownshill Dolmen is in the middle of a field, some distance from the road (the R726 passes right by). Though the dolmen is generally clearly visible from the road itself, the comparatively small parking area and quick glimpse might prove too little for those in a hurry. Thankfully the signposting is at least adequate. The Brownshill Dolmen is sited on a (very moderate) hill - nearby are the former estate and house of the Browne family, hence the name. It is, however, far older than this “family connection” might suggest. The massive structure was erected sometime between 4,000 and 3,000 BCE, more than likely by a farming community living in the general area. Note that these were not the Celts, they came (if at all, the invasion theories are disputed) a few thousand years later. 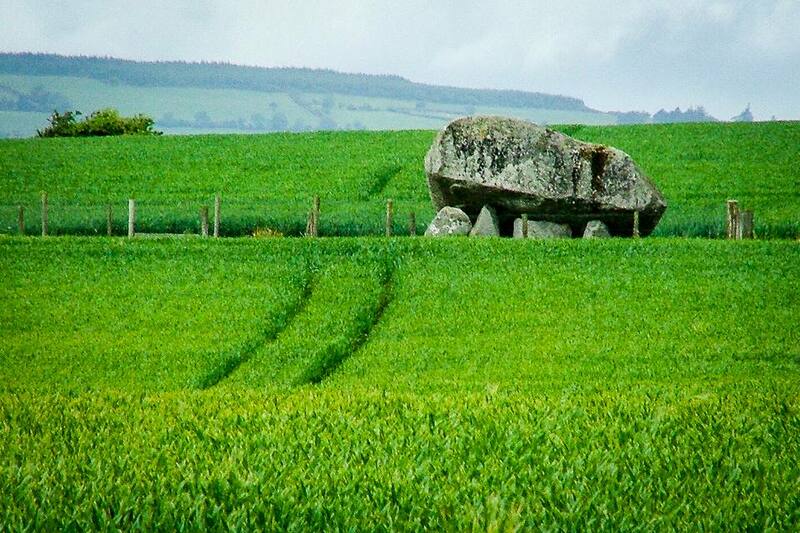 Thus the Brownshill Dolmen should not be seen as "Celtic heritage". Irish for certain, but who the “Irish” of the time were, and how they identified themselves, is entirely in the realms of speculation. Brownshill is technically classified as a portal tomb - because the entrance to the chamber (which might have been a burial chamber, or served other ritual purposes, or both) was flanked by two large and upright-standing stones (so-called orthostats). These are supporting the capstone, the granite roof of the chamber. The latter is still big enough to sit in if you can stop thinking about all of that weight above you for some minutes. Most of the monument is generally believed to once have been covered by earth, thus forming a mound similar to those at Newgrange or Dowth. A so-called gate stone blocked the entrance (at least symbolically) and may have denoted the border between the normal world and the otherworld. At the Brownshill Dolmen both portal stones and also the gate stone is still to be seen. The massive capstone rests on top of them and slopes down to the ground, away from the entrance area. A Portal Tomb Like Any Other? And what makes Brownshill Dolmen so special? Certainly not its general layout, or any exciting rock art. On the contrary, the prehistoric erection is proof that size sometimes really matters: the capstone (the "roof" of the whole construction) weighs in at an estimated 100 metric tons. It is reputed to be the heaviest known capstone in Europe, or at least in the British Isles. Our knowledge of the Brownshill Dolmen beyond the technical side is at best sketchy, readily observable facts are the bare bones of it. This is mainly due to nobody ever bothering to mount a proper (i.e. time-consuming and expensive) archaeological excavation. While another standing stone close to the dolmen could be (part of) the remains of a forecourt, neither the extent of the chamber nor the mound, has been determined. Theory One posits that the capstone was not moved at all - it was found in situ and holes were then dug to accommodate the much smaller stones supporting it. Afterwards more earth was removed, with the capstone then settling upon its new supports. Feasible, though a lot of luck plays into it, mainly regarding the lowered ground holding up to the massive pressure. Theory Two calls for another earth-moving effort - the supporting stones were first secured, then the capstone was pushed and dragged up a ramp, maybe rolling on logs. Again feasible, but certainly back-breaking. The common factor in all theories is the capstone being where it is now, or at least just a ramp away. There is no evidence that the stone was transported over a long distance at all. Mind you, if you were to break to capstone up today, you’d need at least four of the largest road-legal dump trucks available in Ireland to carry the rubble away! Verdict: Worth a Visit, or Even a Detour? This is definitely in the eye of the beholder - yes, it is massive and impressive, and if you are into megaliths and dolmens, you should definitely see it. It is also quite possible to be the only visitor here (many take a snap from the car park and, especially in rain, do not make the trek around the field). On the other hand, visitors that are not impressed by size alone, and want a more elaborate attraction, might feel a bit underwhelmed. Having said that, there is no charge to visit the Brownshill Dolmen, so you might as well make the effort. For me, it certainly was worth it. If only to bag another dolmen, and an impressive one to boot. And if you are in the area anyway, you might want to visit the Clochaphoill or Aghade Holed Stone as well.